Spring may be here, but winter is not far in our past and it was a bad one for farmers trying to grow year-round. The frigid temperatures made it difficult for local farmers to keep their spinach and other winter greens going in the hoop houses, which normally work well for such crops. So we had to get creative this month in seeking out some locally grown items. 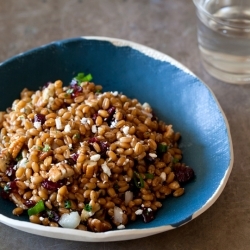 That’s why April Farm Fresh Food Days will feature wheat berries grown by Amish Farmers in Homer, MI and dried MI cranberries from Graceland Fruit Co-op in Frankfort, MI. They will be sampled in a Wheat Berry Salad, which we hope will be a great local addition to the whole grain dishes that the food service staff have been trying out more of this year!